One might think that if part of a design collection is purchased, considering the “theme” of the collection is the same, that a single set will suffice. And, I must say, from some digitizers, that axiom is true because their collections are all designed for a single type of usage, such as quilt blocks or linen corners. 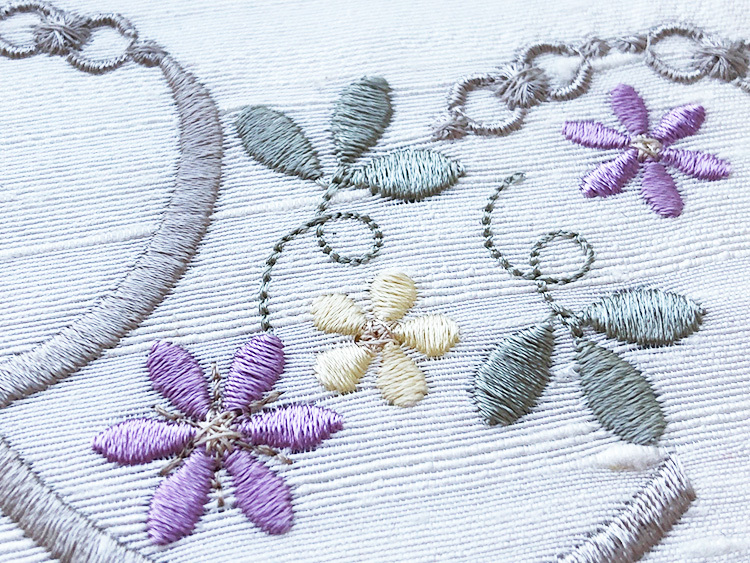 However, Graceful Embroidery complete Collections feature various sets beginning with individual elements which build in size and variation throughout all the sets within the collection allowing them to be interchangeable. Pamela’s Joy is a perfect example of why a complete collection is a true benefit. Set 1 offers delicate designs perfect for children’s garments. 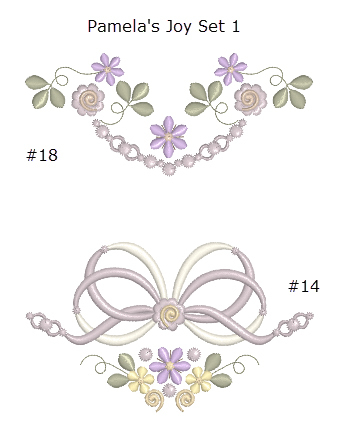 Picture design #18 on the front yoke of a gathered dress with design#14 stitched on each side seam along the hem. Set 2 progresses with larger designs adding unique accents. Repeating the same design placement suggested above for a child’s dress, the larger expanded, designs are now more in proportion on an adult nightgown. Set 3 sees larger, more complex element combinations inspiring thoughts of linens and home deco projects. Try embroidering on a pre-made, hem-stitched linen place mat for a treasured gift. Without examining each of the five sets that make up the Pamela’s Joy Collection, it is becoming apparent that there is a purpose to every one of them. This purpose is not to limit how they are used, but rather to inspire creativity with embroidery elements within the various sets to complement each other. Design #6 from Set 4 was centered in a 460mm square working space-18” square. Design #2, Set 2 was placed in each corner for a quick, easy layout for a throw pillow. 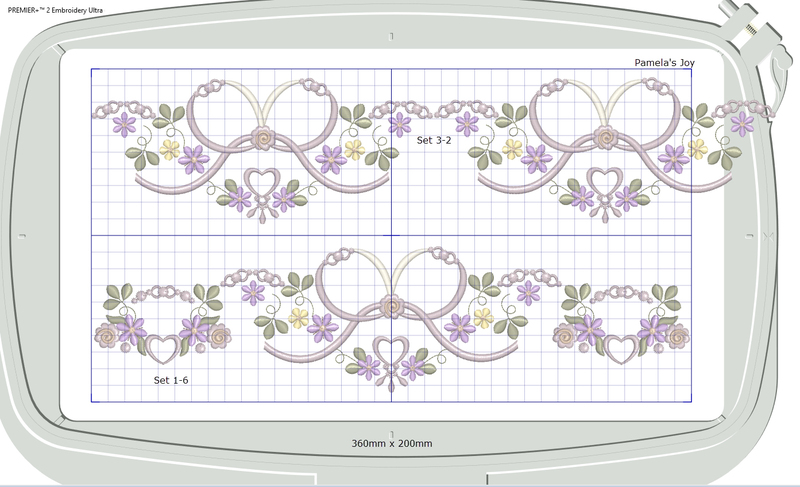 Remember, Graceful Embroidery designs include OAS-Outline Alignment Stitches- which are extremely helpful not only when planning larger layouts, but also in accurately stitching them. A tutorial may be purchased if additional information is needed concerning proper OAS usage. Multiple sets within the same collection offer the benefit of combining designs to fill a predetermined space. 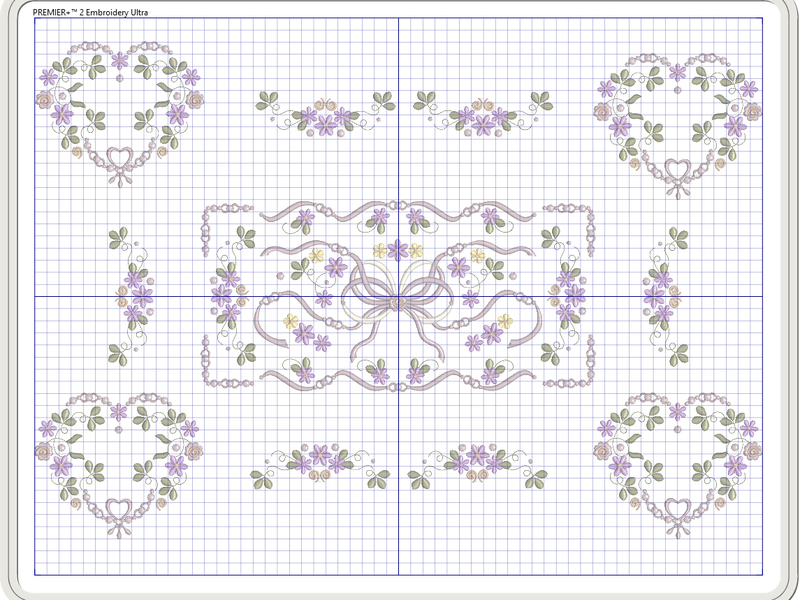 Using a 360mm (14⅛”) border length, repeating design #2 from Set 3 is too long. However, adding one of the smaller designs from another set, Design 1-6, fills the area nicely. Combining designs, especially in borders, breaks up repetition as an “original” design is created for that special project. 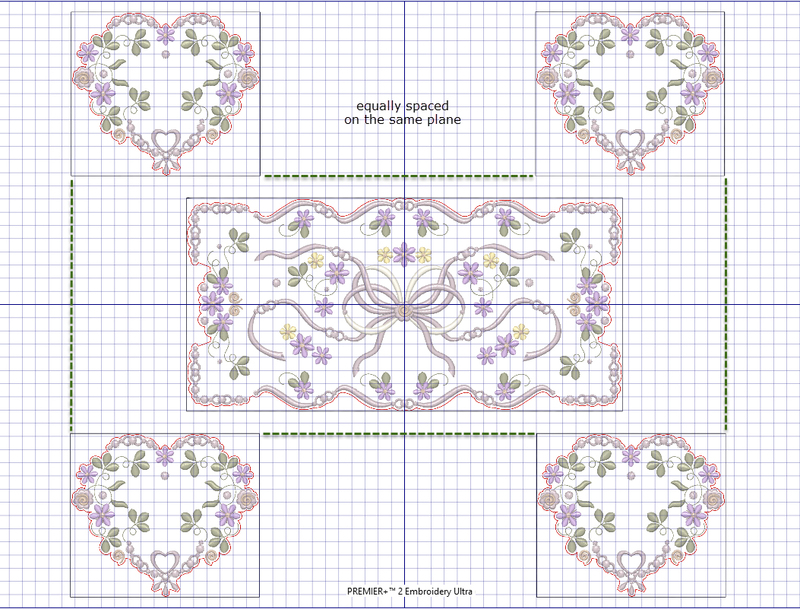 Pamela’s Joy also offers two sets of 8” Quilt Blocks. Yes, they are perfect, on their own, for stitching a quilt. But here again, the blocks can be used in many other projects; tote bags, wall hangings, throw pillows, table linens. Combining the blocks with the other Pamela’s Joy sets expand the endless layout possibilities. The designs above are perfect for a 16” pillow. Each element can be stitched individually on fabric. Each piece of embroidered fabric can then be re-cut to proper size insuring that the design is centered before stitching the patchwork together. When all the sets are yours, projects don’t have to be complicated, even if they look as though they might be. However, they will be beautiful! Hazel comments: I decided to follow Pamela’s instructions, combined a design and stitched it out. This is the result. During May 2018, the Pamela’s Joy collection, which consists of 5 sets, is available for just $35. This is such a versatile set ! I love it. Because of the different sizes you can create your own designs by putting smaller designs together in various ways. Brillant! Off to buy my set! Thank you Hazel for yet another wonderful set! Make sure you share photos of what you produce with these designs, as that inspires others. Enjoy! Owning an entire collection of designs allows for so many more possibilities of combining designs and enables one to use a variety of different hoops to make a variety of projects. Love getting photos of how customers use my designs.